Indian anthem Jana Gana Mana turns 100! December 27, 2011 will not only be remembered as the day when Anna Hazare took Mumbai by storm with his fast against corruption. This is also the day when India’s national anthem – ‘Jana Gana Mana’ turned 100 years old. 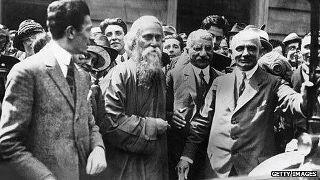 Rabindranath Tagore’s ‘Jana Gana Mana’ was first performed on December 27, 1911, at the Calcutta Session of the Indian National Congress which underscored a national movement. The Constituent Assembly adopted ‘Jana Gana Mana’ as the national anthem on January 24, 1950. Interestingly, Tagore’s ‘Jana Gana Mana’ overruled Bankim Chandra Chattopadhyay’s ‘Vande Mataram’ in the face of Muslim opposition, thereby becoming the national anthem of India. Written in Sanskritised Bengali, ‘Jana Gana Mana’ ran into controversy when in year 2005, a petition was filed in the Supreme Court demanding the inclusion of the word Kashmir and the deletion of Sindh, which became a part of independent Pakistan after the 1947 partition. However, the Supreme Court ruled against the petition stating that the national anthem is “a hymn or song expressing patriotic sentiments or feelings” and “not a chronicle which defines the territory of the nation”.